Historic old Bergen House from 1870 newly renovated. in center of Bergen. only 5 minutes to fish market and all other central places. The house is located at the hill side off mount transducer and nice recreation areas just outside you doorstep. The house has three floors. firstfloor two bedrooms and one bathroom with shower and washing machine. Second floor has a living room, dining area and kitchen. Third floor has one bedroom, TV salon and a small toilet. The house is fully equipped for your holiday stay. Charming apartment! Close to everything! Therese was wonderful and most accommodating. Such a pleasant experience and would definitely return! Lovely home right in the heart of Bergen. This home is absolutely lovely and the location couldn’t be better. The home was plenty roomy for myself, husband and adult daughter. The 2nd floor had a nice sitting room, dining area and fully stocked kitchen. It is located within a 10-15 minute walk of Bryggen, fish market, museums, Floien, and restaurants. Therese met us when we arrived and had a city map and showed us where things were. She was very accommodating and even allowed us to store our luggage into the afternoon on our last day as we had a late flight. I highly recommend this home! Do not hesitate to stay here. You’ll love it. Our party of 6 stayed at Therese’s property 7/6-7/10/18 and absolutely loved it! Therese is the kindest, most accommodating property owner we have encountered! She was so kind to allow us use of the property longer than expected due to a delayed flight even though she had guests arriving as we left! The property has charm due to its design, but Therese has added wonderful Scandinavian touches in the decor. The beds were very comfortable and the washing machine was a great amenity! The location of this property is perfect for shopping, sightseeing, restaurants, close to everything! We hated to leave! Thanks, Therese! We loved being so close to the center of Bergen - everything we wanted was within easy walking distance. The house was as pictured and described and quickly felt like home. (Note that navigating stairs is key as the main living spaces are on the second floor.) We did not want for anything at the house. Therese was easy to communicate with, meeting us when we arrived to show us the house and to mark various attractions on a local map. While we struggled to pay via bank transfer before arriving, Therese was very flexible and allowed us to leave cash as we departed. Overall, a wonderful experience in a wonderful city! I was looking for a house with authentic Scandinavian character. We were very pleased to find this quaint historical house on a quiet street. It is a walk from the train station and a walk from the historical wharf and fish markets. We were a little tentative with the photos we saw but were pleased with our stay! It is clean and has all the modern amenities a person is accustomed to with lodging. It does have steep stairs on its 3 floors, but my 81-year old mother navigated them without problem. Therese is very friendly and accommodating; she responds to email queries right away. We really enjoyed our stay there and would've stayed longer if we had not been leaving to a different city! 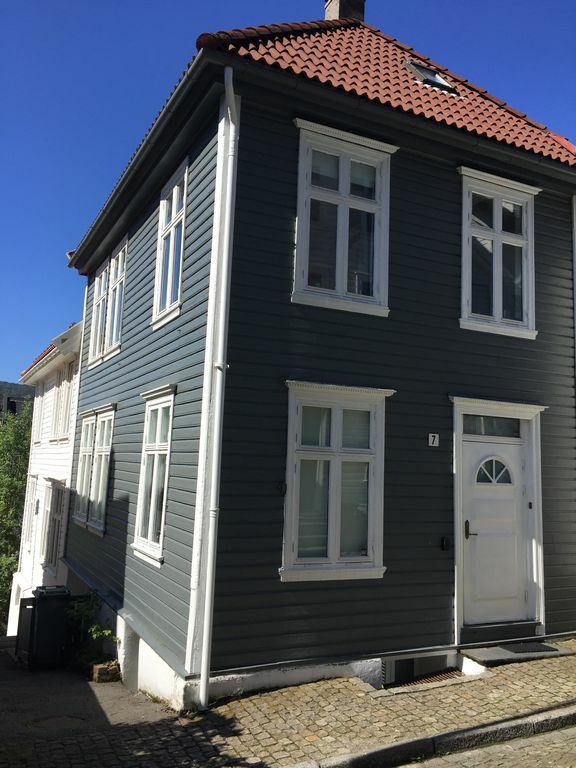 This charming, comfortable house provided a memorable experience in Bergen for three generations of our family (four adults and two children, ages 10 and 13). The location is very convenient for exploring all parts of this beautiful city, and one feels part of the surrounding neighborhood. Therese, the owner, was responsive from our first inquiries, and she was there to welcome us and provide assistance when we arrived. The layout of the house may seem unusual to some: ground floor with two bedroom and full bath/laundry; second floor with comfortable living/dining area and well equipped kitchen; third floor with sitting area and TV, large bedroom, and half bath. This layout, however, works well for extended families of various ages, like ours, or for several friends sharing the house. [The only caveat is the safe but circular wooden stairs between floors; guests unable to climb stairs or those with young children (perhaps under 4) might find the house a challenge.] I would not hesitate to recommend this house to anyone visiting Bergen, and we hope to stay there again on a future trip. Very central, in the middle of the city in a quiet old narrow street. 5 minutes walk to railway station, 7 minutes walk to airport bus, close to public transport, close to restaurants and city center. Fully equipped, but no personal belongings in drawers and cupboards.